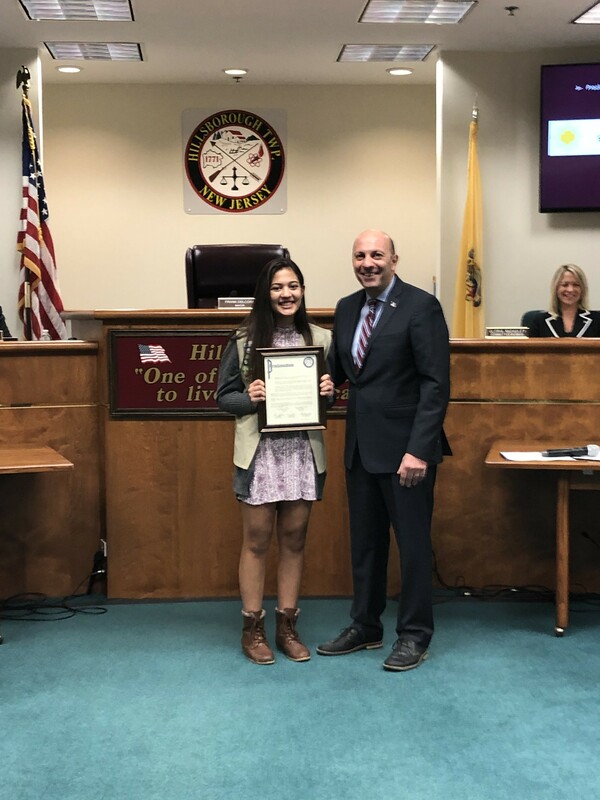 Anisha Gademsky, a junior at Hillsborough High School and member of Girl Scout Troop 60365, was honored at the January 8, 2019 Township Committee for earning her Gold Award. Anisha’s Gold Award project involved creating a “Senior” prom for the Foothill Acres Nursing Home in the hope of helping the residents relive their younger days and provide a night they would remember and enjoy. The residents were provided with boutonnieres, food, dessert, and music. A Prom King and Queen were announced. The project took 92.5 hours of preparation. Anisha is a member of the National Honor Society and French Honor Society, is on the Hillsborough High School softball team, and participates in a travel softball team. She also tutors children and volunteers at softball clinics and in the gift shop at Foothill Acres Nursing Home. The Hillsborough Township Committee congratulates Anisha for having earned her Girl Scout Gold Award, an honor for both her and for those who have guided her, and wishes her all the best in her future endeavors.